Shown to reduce pimples in just 4 hours. The second you put it on, the powerful gel with breakthrough technology starts to dissolve surface oil on the skin. With oil out of the way the clinically proven acne medicine can then penetrate pores. The medication starts to clear pimples immediately, with maximum strength 2% Salicylic acid. Voila! Pimple looks better. Now get out there and have some fun! So wash your face then apply a thin layer over your face. You can do this up to 3 times a day. If your skin starts to dry out or peel, reduce your use to once a day. I have been getting really bad acne and after just a week of using it my skin has cleared up significantly and stayed clear. 100% recommended this. I recommend it to all my friends and family l! Give this product a chance and you’ll see the results!! I can honestly say i saw results in my first use. YOU WILL NOT REGRET! LOVE this product. It truly reduced my larger pimples within 4-6 hours. I usually apply it before I go to bed and in the morning, the pimples are almost gone. Only bad thing is that it dries out my skin if I use it a few times a week. I also wish I could buy it in a larger container. My face is a mixture of oily and dry, with most of my breakouts on my cheeks and blackheads on my nose. Definitely recommend!!!!!! We'd like to learn more about your experience using our product! Please give us a call at 1-877-754-6411 M-F between the hours of 9A-5:30P ET. Thank you and have a great day. In early 2018 I broke out with absolutely terrible acne all over my face, the kind that you see in the horror "before and after" advertisements for miracle products we know are probably a scam. I have very sensitive skin so I decided to be patient and use very light, generally non-chemical based treatments and saw no changes at all. My face was covered in awful scabs and so bumpy all over. I knew I was going to have to change what products I was using, and happened to see a review of this one and figured it really couldn't get much worse if this product messed up my skin. So I gave it a try! I'm about 3 months into using this product. At first I applied it 2-3 times a day, now I only do one application. 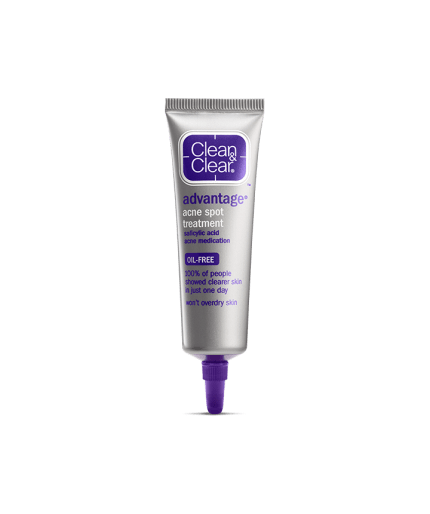 I experienced some peeling but if you pair this up with the moisturizers Clean and Clear has, you should be able to maintain it. I can finally feel my skin with little to no bumps, and any small breakouts I get here and there are gone within a day or two using this product. I honestly can't praise this product enough it really worked miracles. I saw MASSIVE improvement in just the first month, but expect to be waiting a bit longer than that to be near spotless. Now my only worries is getting some of this old scarring cleared up. I can't thank Clean and Clear enough for this product, I swear on it and recommend for anyone to give it a try. It may not work for all skin types but it definitely worked for me. Hello there! We'd love to learn more about your experience using our product! When you have a minute, please give us a call at 1-877-754-6411 M-F between the hours of 9A-5:30P ET. We are looking forward to speaking with you! i have used it twice daily for 2 days...didn not find it helpful. My acne kept growing in size. We're so sorry this happened! We wouldn't expect this of our product. When you have a moment, we'd like to learn more about your experience. Please call us at 1-877-754-6411. We're available from 9AM-5:30PM ET, Monday-Friday. We hope to hear from you soon! I used this product and the first use it seemed to work, my acne decreased a little in size and the reddness went down. However the next time and any time after my acne became SO much worse. I do not tend to have bad acne, usually just pimples when I eat bad or don’t wash my face properly. Using this product made my pimples turn into huge purple bumps that were painful and lasted an extremely long time, my face was covered. Completely embarrassing, and awful. I ended up looking this product reviews up and saw comments with the same reaction. Will never ever use or recommend, please don’t use! Oh no! We definitely wouldn't expect that to happen when using our spot treatment. We'd like to learn more about your experience and see how we can help. Give us a call at 1-877-754-6411, M-F from 9am to 5:30pm ET. Can't wait to hear from you!